Situated on the Strip, this hotel is within 1 mi (2 km) of Ripley's Believe It or Not, WonderWorks, and Coconut Creek Family Fun Park. Shipwreck Island Waterpark and Pier Park are also within 6 mi (10 km). 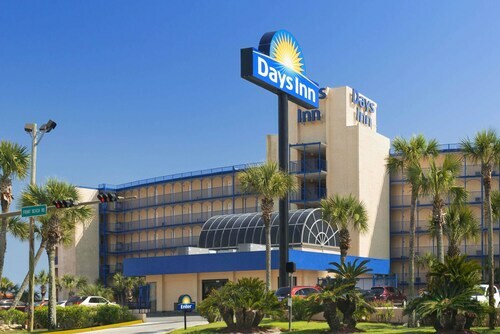 Located in Panama City Beach, this beachfront hotel is in the entertainment district and within 1 mi (2 km) of Ripley's Believe It or Not and Shipwreck Island Waterpark. Capt. Anderson's Marina and Pier Park are also within 6 mi (10 km). 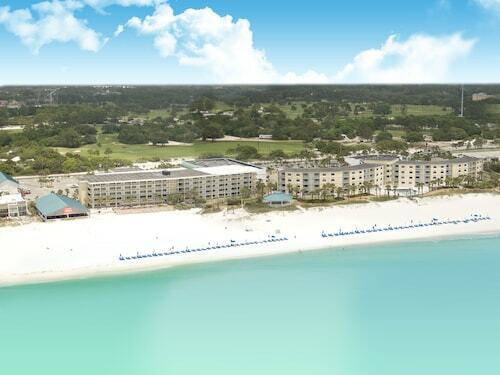 Legacy by the Sea is a beachfront resort located a half-mile from Gulf World, 1 mile from Pier Park, and three miles from Shipwreck Island Water Park. 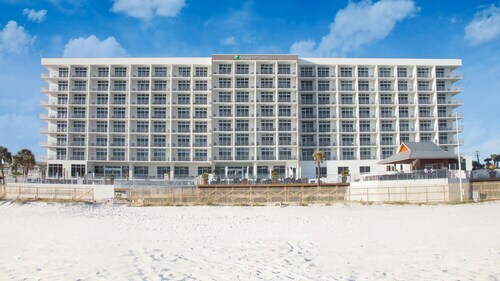 Nestled on the beach, this Panama City Beach hotel is within 1 mi (2 km) of Museum of Man in the Sea and Russell-Fields Pier. Pier Park and Frank Brown Park are also within 2 mi (3 km). 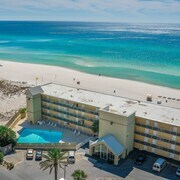 Nestled on the beach, this Panama City Beach hotel is within a 15-minute walk of Signal Hill Country Club, Ripley's Believe It or Not, and WonderWorks. Shipwreck Island Waterpark is 2.3 mi (3.7 km) away. Nestled on the beach, this Open Sands motel is within 3 mi (5 km) of Hidden Lagoon Golf and Racetrack, Shipwreck Island Waterpark, and Pier Park. M.B. Miller County Pier and Holiday Golf Club are also within 1 mi (2 km). 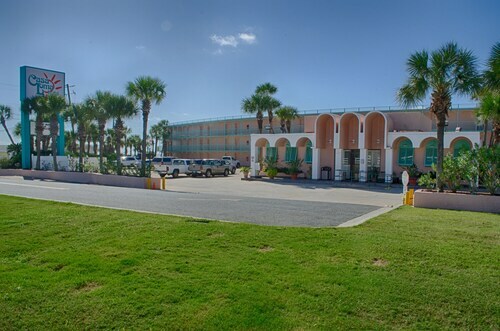 Located in Open Sands, this beachfront hotel is in the entertainment district and within 1 mi (2 km) of Gulf World Marine Park and Pier Park. Shipwreck Island Waterpark and Frank Brown Park are also within 3 mi (5 km). 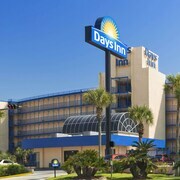 Located in Panama City Beach, this beachfront hotel is in the entertainment district and within 1 mi (2 km) of M.B. Miller County Pier and Shipwreck Island Waterpark. Ripley's Believe It or Not and WonderWorks are also within 3 mi (5 km). 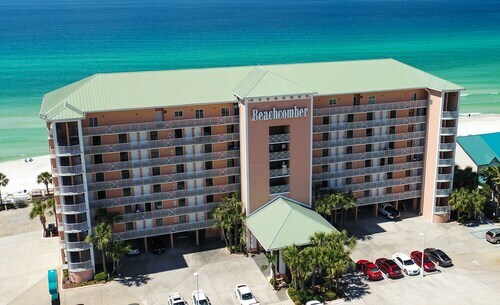 This Panama City Beach hotel is a quarter-mile from Gulf World Marine Park and 5 miles from St Andrews State Park. 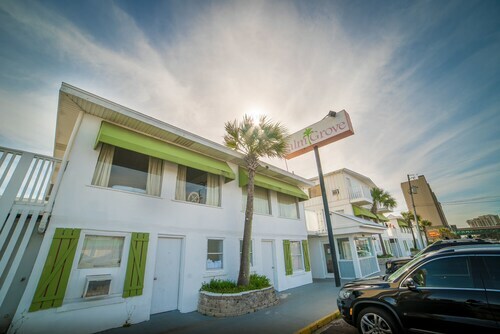 Nestled on the beach, this Open Sands motel is within 3 mi (5 km) of Hidden Lagoon Golf and Racetrack, Pier Park, and Shipwreck Island Waterpark. Frank Brown Park is 2.7 mi (4.4 km) away. 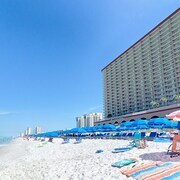 Beachside Resort Panama City Beach is as suitable for a romantic break as it is for an action-packed vacation. Guests can swim, sail, and fish on the Gulf right outside. They can also drive to Panama City in 15 minutes, and explore the one-time pirate hideout on Shell Island, in nearby St. Andrews State Park. 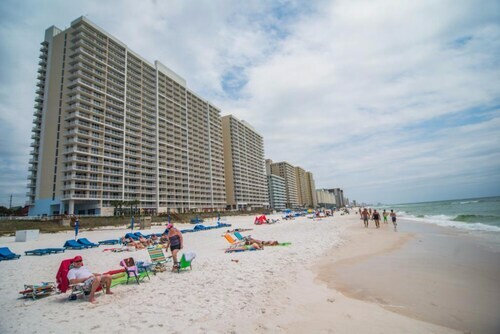 How Much is a Hotel Room in Panama City Beach? 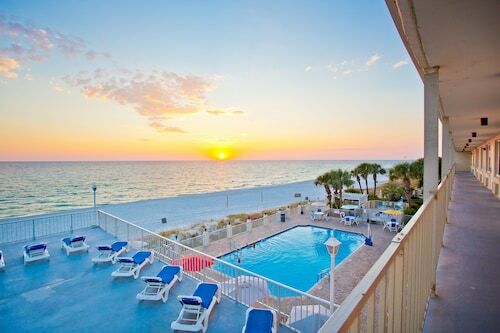 Hotels in Panama City Beach start at $61 per night. Prices and availability subject to change. Additional terms may apply. Adventurous visitors to Panama City can locate an abundance of accommodation alternatives to select between in Panama City Beach. 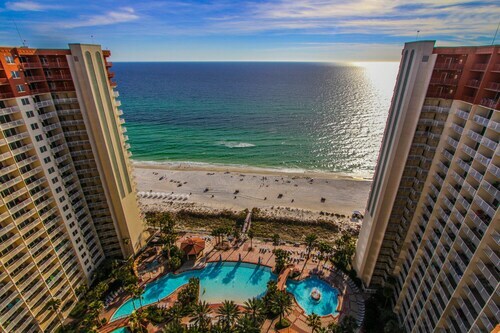 Travelocity's comprehensive database is a great place to discover 95 accommodation options within 6 miles (10 kilometers) of downtown Panama City Beach. We understand that convenience is make-or-break for hassle-free travel, so be sure to read about the Calypso Resort & Towers by Sterling Resorts and The Driftwood Lodge, which are conveniently located within a 0.6 miles (1 kilometer) stroll of the town center. 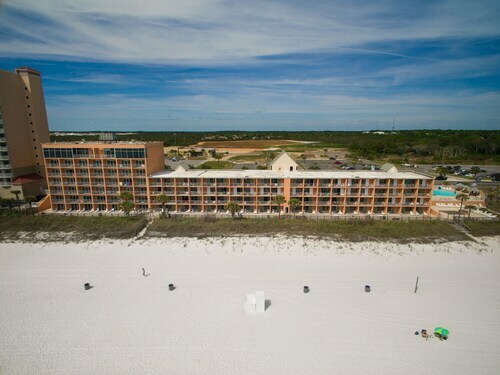 The Sunrise Beach Resort by Wyndham Vacation Rentals and Sterling Breeze by Sterling Resorts are two hotels that are found within a short distance of the Pier Park. 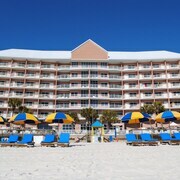 The Sunrise Beach Resort by Wyndham Vacation Rentals is only 1 mile (2 kilometers) away from the Pier Park. The Sterling Breeze by Sterling Resorts is 0.7 miles (1.1 kilometers) away. Budget-minded travelers will be happy to know that there's a nice selection of cheaper lodgings in the vicinity of Panama City Beach. 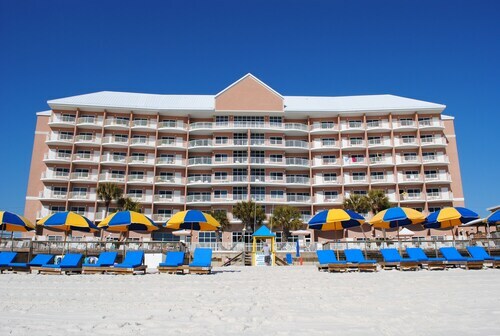 The Shores of Panama by Resort Collection is 5 miles (8 kilometers) from the main part of Panama City Beach, while the Boardwalk Beach Resort Hotel is 5 miles (8 kilometers) away. 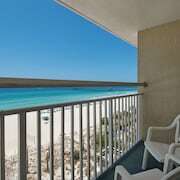 Some more Panama City Beach hotels in the lower price range are the Origin At Seahaven and the Beachside Resort. 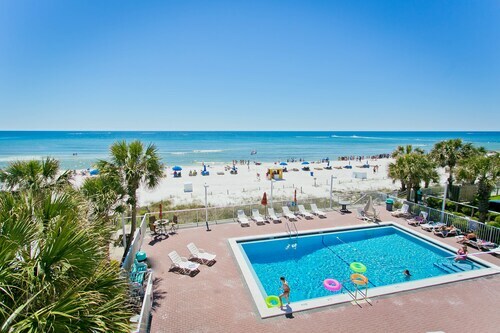 The WaterSound - Florida Vacation Rentals is 13 miles (21 kilometers) from the main part of Panama City Beach. Also, the High Pointe Resort by Wyndham Vacation Rentals is situated 10 miles (16 kilometers) away. The Boardwalk Beach Resort by Royal American Beach Getaways as well as the Sterling Resorts- Ocean Villa are two other Travelocity-listed accommodation options around Panama City Beach. The larger Florida Panhandle district is definitely worth discovering too. Photographers will fall in love with Florida Panhandle's beaches. On top of that, explore some of the region's lighthouses. In this part of United States of America visitors might also take up the chance to partake in hiking, shore fishing and picnicking. The nearest places to spend the night in Panama City include Inlet Beach and Rosemary Beach. Inlet Beach is 9 miles (14 kilometers) to the northwest of Panama City Beach, while Rosemary Beach is 10 miles (16 kilometers) to the northwest. 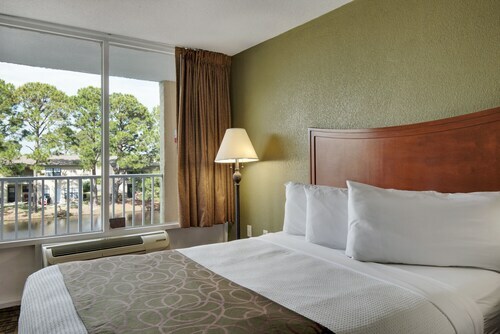 Accommodations in Inlet Beach include the Carillon Beach Resort Inn and Carillon Beach Resort Inn by Wyndham Vacation Rentals. 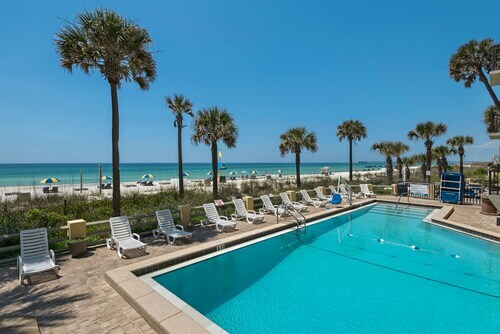 The Condo Vacations by See Ya At The Beach and Village of South Walton by Wyndham Vacation Rentals are a selection of the rooms in Rosemary Beach. Our city guide is also an enlightened way to discover more tips for Panama City Beach. We got there early with a sick child and ask if we can check in early. Front desk said she was calling house keeping to make our room priority to be cleaned. We Called back 2 hours later and the person at the front desk was very rude and said check in is between 4:00 pm and 6:00 pm. We waited a while longer closer to 4:00 pm and my husband went into the front desk and got a room finally. Why bother saying you will get us in early if you're not. I could go on and on but I'm not. The front desk staff was rude and very slow. What should have been a simple 5 minute process took 20 minutes. With 2 children under 3 this was a headache. I liked everything in general about the property. The only problem I had is my room reservation made through Travelocity was not captured. They had no record of it. The desk clerk was able to get me another room so everything worked out fine.